Hundreds of the world’s largest companies have publicly committed to remove deforestation from their commodity production and supply chains, but until recently they only disclosed progress on one out of three pledges. New findings from Supply Change, a Forest Trends initiative, shows a dramatic increase in disclosure and clear recognition on their part for the need to work with small farmers. 15 March 2017 | In the last three years, hundreds of companies have pledged to reduce their impact on forests by changing the way they produce or procure the four commodities driving most deforestation – namely, palm, soy, cattle, and timber & pulp – but until recently, they were only disclosing progress on one-third of their commitments. That changed dramatically over the past year, as a new report from the Forest Trends Supply Change initiative shows. 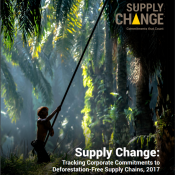 In “Tracking Corporate Commitments to Deforestation-free Supply Chains, 2017“, published today, we identify 447 companies that have made 764 individual pledges, and we found they are publishing progress on more than half of them – a dramatic and encouraging increase from last year. Discouragingly, roughly 20 per cent of the 764 commitments have gone “dormant” – meaning the target date has passed without any progress being reported. Nevertheless, the trend is towards more disclosure as companies implement their strategies. The Intergovernmental Panel on Climate Change tells us that deforestation accounts for roughly twelve percent of all greenhouse-gas emissions, and that the land-use sector – which includes this deforestation as well as farming, forestry and other activities – contributes about 30 percent. At the same time, the land-use sector is extremely vulnerable to climate change. The global rural economy is, therefore, both a leading driver of climate change and one of its most vulnerable victims – yet its own drivers are thousands of miles away, in supermarkets and retail stores across the developed world – and increasingly in emerging economies with a rising demand for the same products and goods. NGOs began highlighting these linkages in the 1990s, leading to the creation of certification standards for palm and timber & pulp in the 2000s and the launch of the Consumer Goods Forum in 2009 to promote action among consumer-facing companies, but 2014 remains the seminal year in deforestation disclosure. That’s when 52 companies endorsed the New York Declaration on Forests, which is a pledge to eliminate deforestation from the production of the big four deforestation commodities by no later than 2020. Soon, hundreds of companies were making similar promises, and in early 2015, Forest Trends launched the Supply Change initiative to track both the full spectrum of commitments tied to the “big four” and – more importantly – the progress they’re reporting towards achieving those commitments. In March 2015, we conducted our first analysis of 246 companies that had made a total of 307 commitments related to the big four commodities. One third of those commitments had been made in 2014, and therefore it was understandable that progress reports were only available on a small percentage of them. However, more generally, many of the commitments were vague and overly ambitious. From the beginning, we found that more companies active in palm and timber & pulp were making and reporting on their commitments – largely because of the longer history and prevalence of commodity certification programs like the Forest Stewardship Council (FSC), the Programme for the Endorsement of Forest Certification Schemes (PEFC), and the Roundtable on Sustainable Palm Oil (RSPO). Many fewer companies active in soy and cattle were making and reporting on commitments – which illuminates the inverse of science-based expectations, since cattle production causes ten times more deforestation than palm. Also, cattle supply chains lack globally or even nationally standardized certification schemes for beef and leather. So, hundreds of companies have one or more commitments. Problem solved – right? Commitments fall into a variety of categories, from those promising a complete elimination of deforestation to net zero deforestation, to those promising to implement specific activities – such as protecting peatlands or High Conservation Value areas, or ensuring that commodities are sourced or produced sustainably (which tends to mean conformity to a certification program). The “zero deforestation” pledges are difficult to quantify, because there is not yet an agreed-upon set of metrics by which to measure progress. Some companies, for example, are clearly engaged in activities that will reduce deforestation, such as working with smallholder farms to promote agroforestry, but progress doesn’t lend itself to numerical quantification and verification in the same way that certification does. That may be one reason why annual publishing of quantitative progress is lower than one would hope. Instead, we find that companies may often use important milestones, such as being able to trace supplies to a specific ranch or slaughterhouse as a proxy. Indeed, in many cases they report on those milestones if not on overall commitment. Such traceability is, as it turns out, extremely widespread in cattle, thanks to health requirements by major meatpackers like Brazil’s Marfrig, which are beginning to tap these health rules to track the deforestation impacts of suppliers. As our understanding of deforestation management plans grows, so do the criteria that Supply Change tracks, and this year we began tracking 10 new policies including those that explicitly include a complementary plan to engage with smallholders. So far, 101 companies have made such pledges. Much of this engagement involves support for co-operatives, which is already having an impact on the number of farmers who can produce certified products. This can have a tremendous impact, because independent smallholders supply 40 per cent of the world’s palm but account for less than 15 per cent of the oil certified under the RSPO – largely because the cost of getting certified is higher than smallholders can afford. That’s changing as groups like Indonesia’s 2,700-strong Sapta Tunggal Madiri pool their resources to certify thousands of small farmers at a time. RSPO has also created a smallholder fund that supports roughly 11,000 smallholders controlling 55,031 hectares across six different countries. In total, the RSPO has already certified 113,833 individual independent and associated smallholders with a combined land area of 264,887 hectares. This is promising because demand for sustainable commodities should translate into support for sustainable livelihoods, yet expensive certification programs have been more feasible for larger producers than smaller ones. Only by engaging with suppliers in ways that help them can corporates across the supply chain help themselves.